Where to Mei Mei by Design, a bright blue kiosk made from a repurposed shipping container outside the Seaport’s Innovation and Design Building. This promenade is home to a handful of vendors, including Roxy’s Grilled Cheese and Triangle Coffee. What for A farm-fresh lunch in funky surroundings. Unlike Mei Mei’s truck and restaurant, which specialize in Chinese-American plates, this spot slings quickie bowls filled with fresh veggies, grains, and proteins. 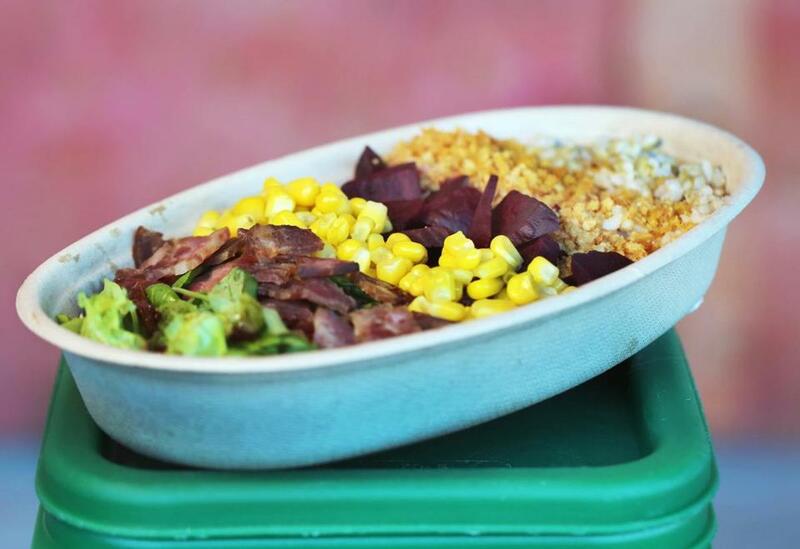 Bowls are named after partner farms. The scene Where is the beach? Why are the surfers wearing Patagonia? These pastel kiosks belong in the tropics, not here in the Seaport! But here they are, drawing hordes of office workers willing to brave the November chill for morsels of sriracha-laced tofu. Many people take their lunches inside to benches at IDB’s Canteen, a social hub that looks like a college community center festooned with corn hole apparatus and dry erase boards scrawled with hash-tags and inspirational quotes. No kegs, but there is a large ad for a restorative yoga class. What you’re eating “Hearty Bowls of Awesome Stuff,” says Mei Mei’s chalkboard. The Hei Wa is a healthy mound of tofu cubes, kimchi, ocean kelp, kale, and brown rice, accompanied by a container of garlic-peanut dressing. Many customers request the Four Star, a seasonal medley of roasted sage sausage, russet potatoes, cranberries, shallots, and arugula. Other bowls spotlight virtuous ingredients like bee pollen and triticale, a wheat-rye hybrid. All that awesome tops out at $11. Care for a drink? Choose among Spindrift sodas, potent Bruce Cost ginger ales, or Red Jacket ciders and lemonades, cracked open upon request.